This last two weeks have been busy in the evenings which meant the laundry got washed as usual but not folded. You see I had been folding the laundry until my 5 year old informs me that mommy should be doing the laundry. I asked why while I contemplated trying to explain mommy works so daddy does the housework and all the role reversals in that. Her reasoning was much more direct. “When mommy does the laundry I can find my clothes.” Apparently my sorting is some what random, some of her stuff was ending up in her brothers and mommies drawers and vice versa. The solution was that we all do it. I have a very direct approach to fixing problems. You tell me there is a problem you get to help fix it. Now the procedure is that on a night that we need to fold laundry we pick a show off the PVR and everyone first pulls out blankets, towels and sheets and those get folded and put away. The PVR allowing us to pause the show while we putt everything away. 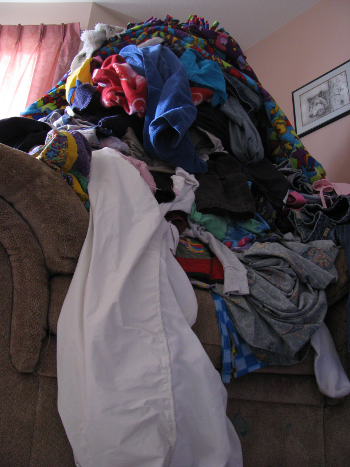 Then every one starts pulling out their own stuff folding it and arranging it into their own pile however they see fit. My son tends to get one large pile while my daughter sorts everything down to warm socks and not warm socks. My toddler just giggles, knocks over piles and randomly grabs clothes to disappear who knows where. The funniest part to me is everyone repeatedly holds up something for my wife and goes “Who’s is this?” Usually she know but sometimes she has to examine it closely first. This pile which was probably a dozen loads took us an hour to fold and put away. It normally doesn’t get this bad and 2-3 loads from the day go very quickly. Next challenge to teach the kids to do their own laundry… That might be a little ambitious but worth a try. They are getting good at the other chores and showing the responsibility need but probably another 6 month before I’ll try teaching them.